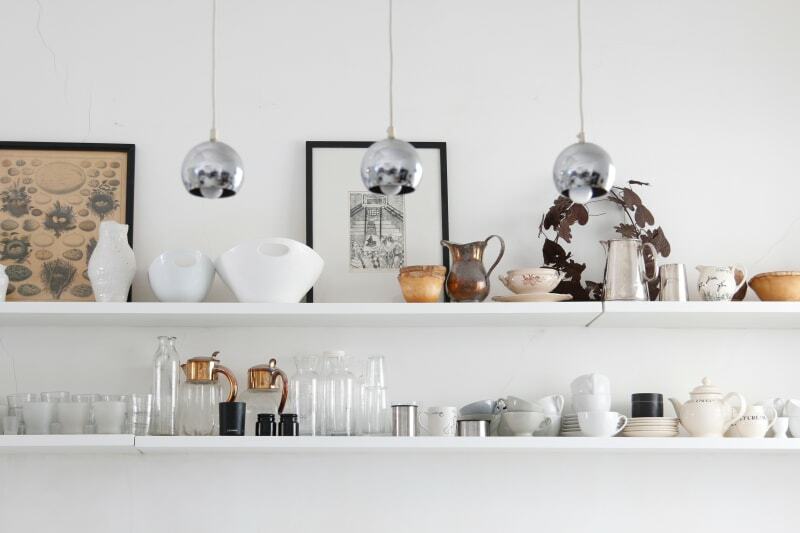 The open kitchen shelves are practical and are used to store glassware, crockery and some items that the owner has collected on her travels. 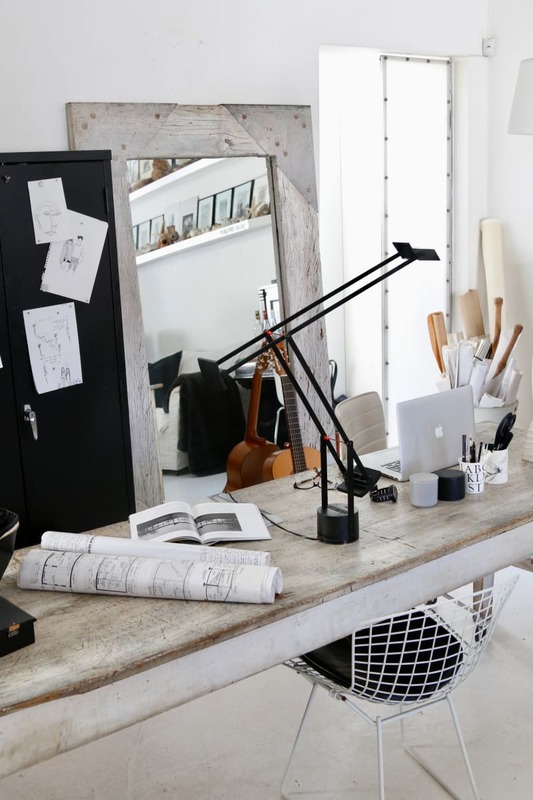 What is it about a black and white space that captures our hearts? This timeless ying and yang duo always remains a popular choice for our living spaces. 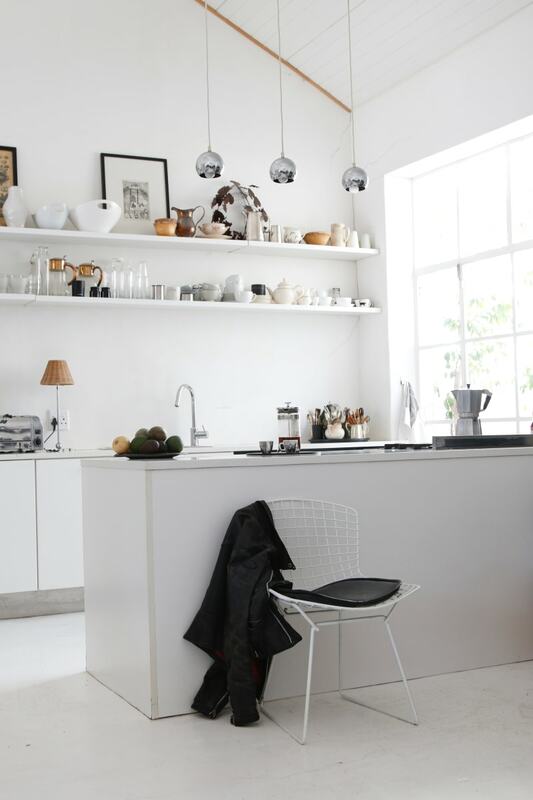 The functional white kitchen is a practical space with open shelves for crockery and glassware, here again accents of black are introduced in the pictures and tableware items. The work area is part of the main living space. It has an old workbench sourced from a country shop used as a desk, and a black metal filing cabinet for storing the owners' samples and paint colors. Her favorite lightning for working is a Tizio. Hand-crafted crockery on a simple white paper sheet. Transcending seasons, countries and cultures in many ways, there is a little bit of black and white in everything. It is neither warm nor cold, neither dark nor light, this is why it works. From the classic chequered floors of well worn classic cafés of Paris to the traditional Mexican embroidery patterns, pared-down design in Scandi minimalism or the opulent colonnaded interiors of Venice with their rich marble and black glass Murano chandeliers. We all love a bit of black and white. In this simple home in Cape Town the owner has mixed design classics with junk shop finds and elements sourced from nature. Burnt black protea tree stems live in handcrafted irregular white vessels, black clay bowls are used for casual meals, and photographs are preserved in simple black frames. Some might say its a bit of everything, all held together by this powerful color combination. Black and white homes are disciplined and easy to live in. Simple white spaces can be transformed by black and white photographs, black hemp bed linen, or an old table lovingly restored by spraying it black and paring it with a set of white ever classic Panton chairs. In this space, the owner has added texture to the mixed, old-weathered workstations, hand-knitted throws and roughly-crafted black clay crockery all add a soulful, earthy touch. Black hemp bed linen and a simple cedarwood chest are the only contrast in this all-white bedroom which looks out onto a small leafy urban courtyard. The main hero of the bathroom is this large white stone bath. The owner has introduced simple accents of black in the bathmat and towels. Black sweet potato bread served on a handcrafted clay plate. This all-white living space has been punctuated with a black lightning, black and white photo frames, a textured throw and black wooden tray. I have worked as a decor editor and lifestyle stylist for the past 25 years and now concentrate on retail and residential interior projects from my home based studio in Cape Town. In my spare time I love to produce and style inspirational lifestyle stories for the media, swim in the sea, walk in the mountains, photograph graffiti, explore remote and beautiful places all over the world and cook delicious food. I am inspired by artisanal crafts, authentic people and spaces! Tucked away in an Australian country town is this historic Stonemasons cottage, nestled in a thickly planted wild garden of grasses and perennials. Aida hade drömt om både ett skafferi och ett gammalt platsbyggt serveringskåp. När hon och Jacob klev över tröskeln på visningen av 20-talslyan i Gamlestaden fanns både och – i en och samma lägenhet. Många renoveringstimmar senare har de format hemmet till sitt eget. From strict respect of history to groundbreaking modern curiosity, the wine cultures of Portugal differ wildly. Anders Melldén makes a journey from “then” to “now” in this wine country full of contrasts. Treat yourself to a good, warm soup prepared with chanterelles or funnel chanterelles.